The European Commission invited societal engagement experts to a one day workshop on how best to involve citizens in R&I agenda setting for the implementation of Horizon Europe. 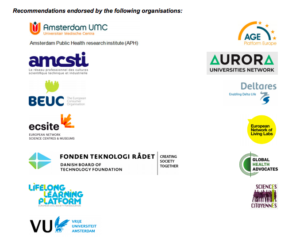 The group strongly supports European Commission’s intention to co-create and co-design the next EU Framework Programme for Research and Innovation. Robust societal engagement is vital to ensuring Research and Innovation (R&I) aligns with the needs, values and expectations of citizens. No one size fits all but all sizes exist, proven methodologies for co-creation processes already exist and should be used. Clarify objectives and roles in the co-creation process, in particular through a typology of civil society organisations. Ensure meaningful engagement through robust and structured participatory methods such as citizens conventions and CSO forums, recognising the vital role of societal engagement in addressing societal challenges and maximising the societal impact of R&I. Embed a consistent approach on societal engagement throughout Horizon Europe by developing a clear roadmap for how an agenda of co-creation will be embedded from start to finish. Build a lighthouse for engagement in Horizon Europe through the continuation of a Science With and For Society programme. Overall approach: top down communication approaches should be replaced with societal engagement approaches.